Today: 3 great organic cleaning + bath products for your pleasure. Get excited. You know I love me some good bath products, and even though I haaaaaaaaaate cleaning my kitchen and bathrooms, there is a great smelling delicious organic cleaner to ease my pain a little so you probably want on that train. Where does one find such magic? The Honest Company. You’ve heard of Jessica Alba, yes? Me too. She seems like a girl I’d want to have lunch with, talk about the horrors of sleep-training and picky eaters, maybe have a girls night on the weekend when the boys are away. So Jessica Alba, pretend girlfriend of mine, started having children a few years ago and discovered that even though there are a hundred billion products on the market for babies, there weren’t a lot of great products she could trust to be safe around her littles. Boy do I feel that. My babes sadly were lucky enough to inherit my allergies to the world at large, and baby products were a landmine from the get-go. All sorts of hidden toxins and allergens are everywhere and Miss Alba said, ‘Eh, nope, we can do better than this for our babies.’. I’m paraphrasing of course, but it was probably something along those lines, so she started The Honest Company, a company with a line of great bath + body products, baby gear, and cleaning products. The motto of The Honest Company, of course, is honesty. Period. If you have questions about what goes into that great baby lotion or bathroom cleaning spray, go ahead and ask, you’ll get your questions answered. The ingredients are really upfront anyway so you don’t have to wonder in the first place. I love a great motto like that: honesty. It feels pretty good when you say it out loud. The multi-surface cleaner (we call it counter spray) rocks my socks off, that’s all there is to it. The spray smells like grapefruit, and not a cloying perfume-like smell, but like you’ve actually sliced a grapefruit in the kitchen and maybe mopped the counter with it. It’s delicious and wonderful and even my allergic-to-jobs children find excuses to use it when they’re forced into Saturday jobs. You can take that all the way to the bank. Also, let’s have a conversation about the honest shampoo and body wash + the face and body lotion. As you can see, I’ve used up the better portion of my shampoo/wash in less than a month. Anytime I can combine a shampoo and body wash in one (a good one that actually works, like this one) it makes my life so much easier, not so much at home but when we travel as a family. That’s a whole lot less to lug around, especially when it works for everyone, not just me. The shampoo has this sort of hippie smell, like you’re taking a chamomile tea shower, but I like it. It does a nice job on my hair and I love the way I smell when I use it as a body wash. 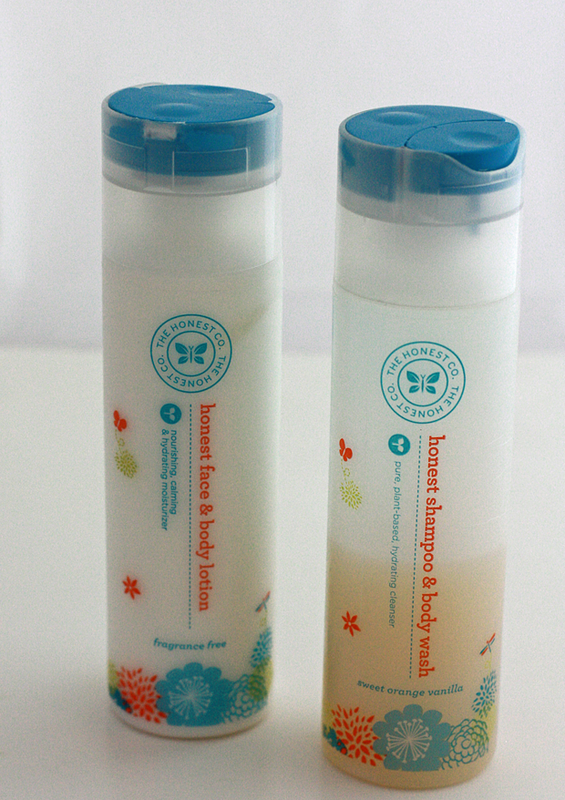 The body lotion is fragrance free (for the allergies within you. and me, mostly me) and is a really nice light moisturizer. So there you have it. 3 nice organic, 100% non-toxic cleaning + bath products for your life. You’re welcome. Thanks for sharing these. I always prefer organic products especially those DIY products. Are these actually organic? Or just plant based? Where can I find them? They are! Click the links to find out where to buy the products. Good luck! How do they smell? I’ve bought organic cleaning products and they usually have an almost too natural smell that I don’t want to use them. But I have a feeling these are going to be good! The shampoo/body soap is super chamomile smelling, you have to get used to it, but it’s a nice smell. The cleaning spray smells so good you’ll want to eat it!